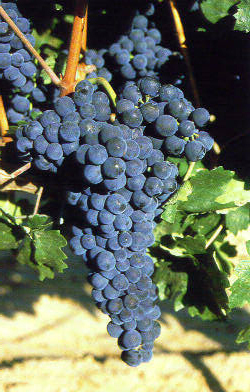 Tempranillo is a variety of black grape widely grown to make full-bodied red wines in its native Spain. Its name is the diminutive of the Spanish temprano (“early”), a reference to the fact that it ripens several weeks earlier than most Spanish red grapes. Tempranillo has been grown on the Iberian Peninsula since the time of Phoenician settlements. It is the main grape used in Rioja, and is often referred to as Spain’s noble grape. Grown early in the 20th century to produce jug wines in California, toward the end of the 20th century Tempranillo enjoyed a renaissance there and throughout the world as a fine wine. The grape has been planted in Mexico, New Zealand, South America, USA, South Africa, Australia, Argentina, Turkey and Canada. Often blended with Grenache and Cariñena (known in Rioja as Mazuelo), Tempranillo is bottled either young or after several years of barrel aging. In Portugal, it is blended with others to produce port wine. Often growing its best at higher altitudes, the grape yields wines that are ruby in colour, with aromas and flavours of berries, plum, tobacco, vanilla, leather and herb. Tempranillo wines are ruby red in colour, while aromas and flavours can include berries, plum, tobacco, vanilla, leather and herb. Often making up as much as 90% of a blend, Tempranillo is less frequently bottled as a single varietal. Being low in both acidity and sugar content, it is most commonly blended with Grenache (known as Garnacha in Spain), Carignan (known as Mazuela in Spain), Graciano, Merlot and Cabernet Sauvignon. Blending the grape with Carignan makes a brighter and more acidic wine. Tempranillo is the major component of the typical Rioja blends and constitutes 90-100% of Ribera del Duero wines. In Australia, Tempranillo is blended with Grenache and Syrah. In Portugal, where it is known as Tinta Roriz, it is a major grape in the production of some Port wines. Tempranillo is currently produced in over 100 California wineries including Hearst Ranch in San Simeon, Longevity Wines in Livermore, and Pamo Valley in Ramona.